Ceremonies were held Sunday at the Auglaize County Courthouse, marking its 125th anniversary. 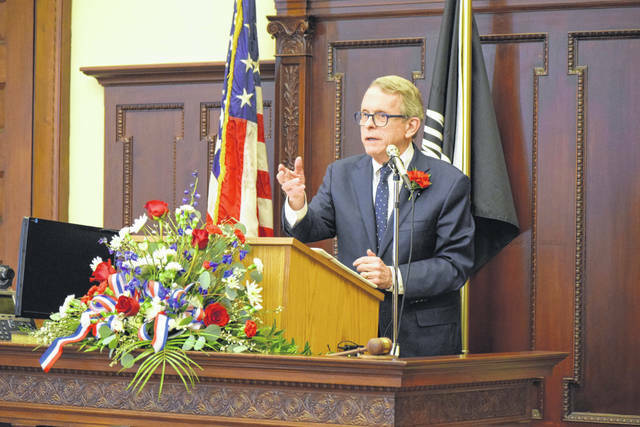 Ohio Governor Mike DeWine makes remarks at the 125th Anniversary of the Auglaize County Courthouse, Sunday. WAPAKONETA — Auglaize County’s courthouse marked a milestone Sunday, turning 125 years old. People got a chance to tour the facility, which underwent extensive renovations in 2011 and 2012. Ohio Gov. Mike DeWine and his wife Fran were also on hand during a special ceremony in one of the courtrooms. “We were talking the other day about this trip, and then we were talking about courthouses in general, and Fran said, ‘A courthouse in a county is really the heart and soul of the county.’ So my main purpose here today is to thank you and thank those who came before you for having the foresight to keep this magnificent building and preserve it because courthouses are very, very special. It’s where justice is done. It’s where people come historically in a gathering place in communities and counties,” said DeWine. The Auglaize County Historical Society organized the anniversary event, which featured tours of the courthouse and a chance to celebrate with punch and cake. 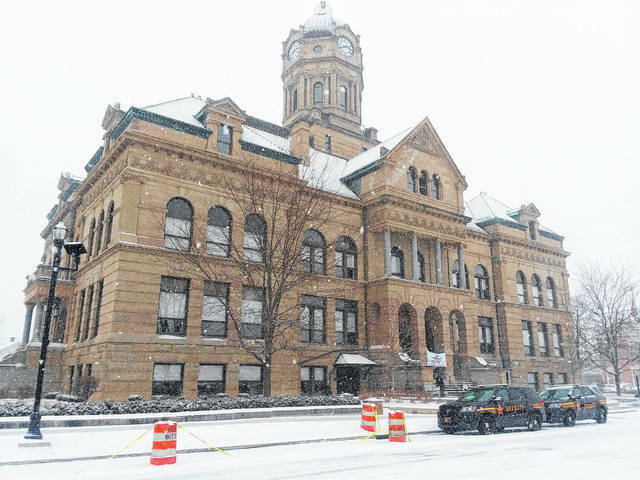 “The county of Auglaize was established on Feb. 14, 1848 and we thought this was a fun time of the year to celebrate our love for our county and for our beautiful courthouse, which is 125 years old this year, and we invited the governor to come. We’re also very excited, of course, because this corresponds with the 50th anniversary year for the Apollo 11 moon landing, which is why our theme for today is ‘Auglaize County Reaches for the Stars,’ because we can all aspire to great things and all aspire to be our best,” said Rachel Barber, administrator of the Auglaize County Historical Society. Earlier in the day, the governor and his wife toured the Armstrong Air and Space Museum. “We’re delighted to see the additional work that’s going on there and the expansion that’s going on there. It’s a great, great thing. This is the 50th anniversary of Neil Armstrong walking on the moon, and for those of us old enough to remember that, we all knew where we were, what we were doing and kind of what we felt as all that was unfolding. We look forward to coming back this summer again for the anniversary,” said DeWine. During the ceremony at the courthouse, members of the Ohio House and Senate presented resolutions marking the 125th anniversary of the courthouse to Auglaize County Commissioner Don Regula. “We’ve had people who said, ‘You guys are spending way too much money on a building that’s old and obsolete,’ and we thought, ‘No. This is what our forefathers decided to do and wanted us to continue that tradition.’ Hopefully, it will last another one hundred some years. We spent $9 million, two years of vacancy and we’re kind of proud of the place,” said Regula.